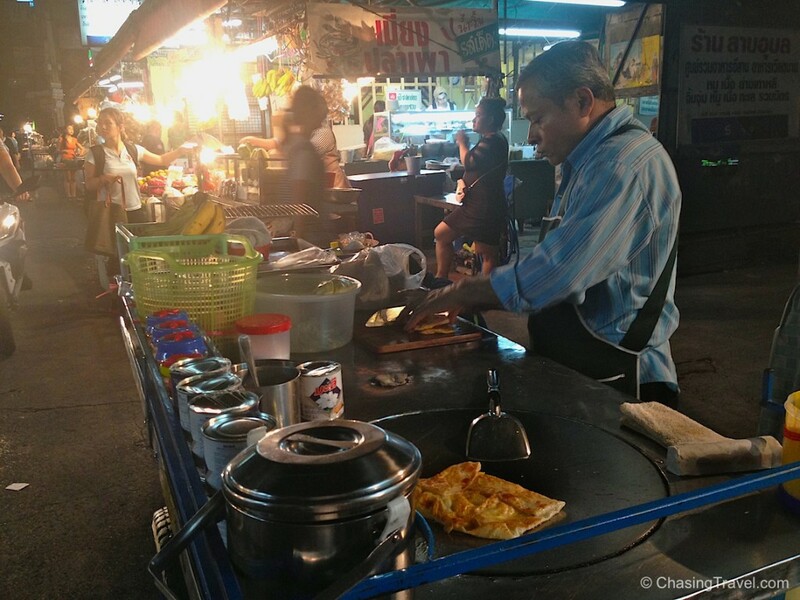 Thailand really is the epitome of all street food cities. Ratty old carts and portable kitchens line the sidewalks. Thai families who live close to the curb open up their homes to sell whatever they’re serving for dinner that night to others passing by. We’ve even seen mechanic shops set up during the daytime turn into Thai street food garages by night. Thai food culture is really quirky and unique this way. 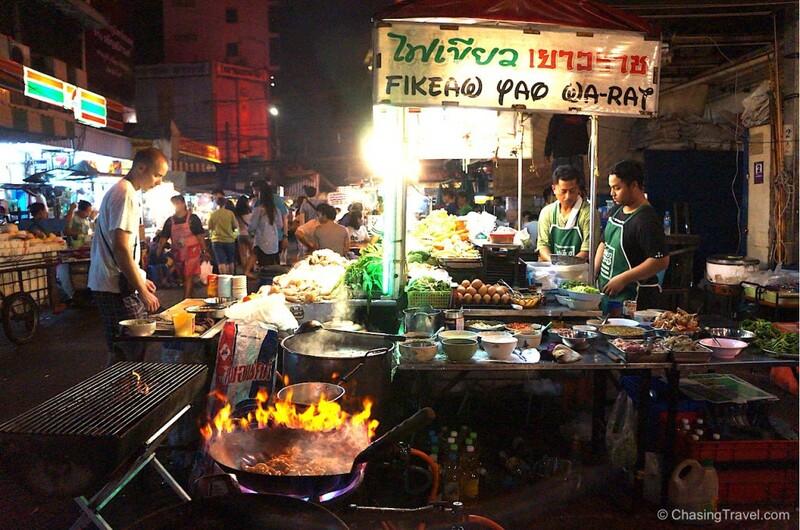 If you’re headed to Thailand, here is our guide to eating Thai street food. 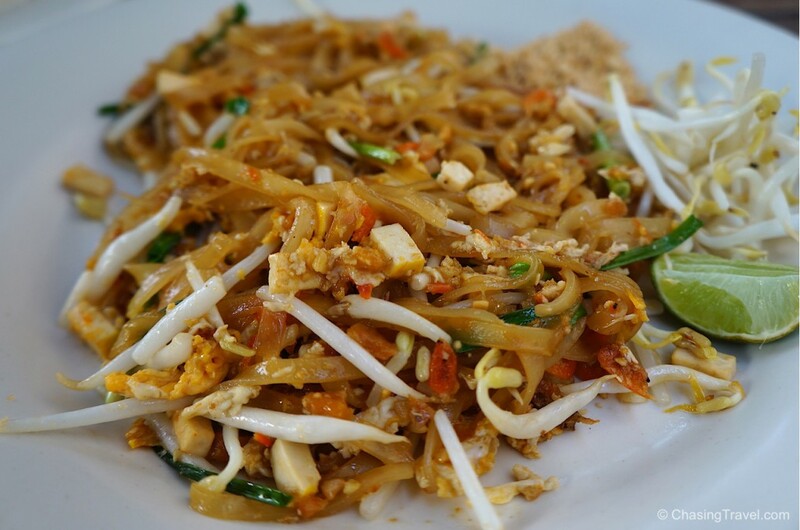 Pad Thai is the ultimate street food and there are hundreds of variations by street food vendors who will cook up a fresh dish right in front of you. 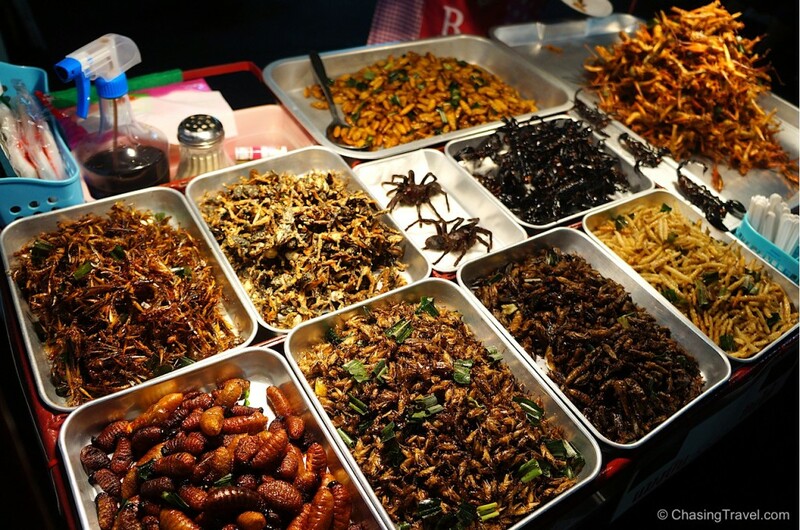 Its main ingredients are rice noodles, bean sprouts, tamarind paste, fish sauce, and chilli pepper. Thai people sometimes add white vinegar or sugar to dishes but I think freshly squeezed lime on top of pad thai is perfect. Roti is a wheat flour, pan-fried bread originally a Muslim food, but Thai people have adopted it too. 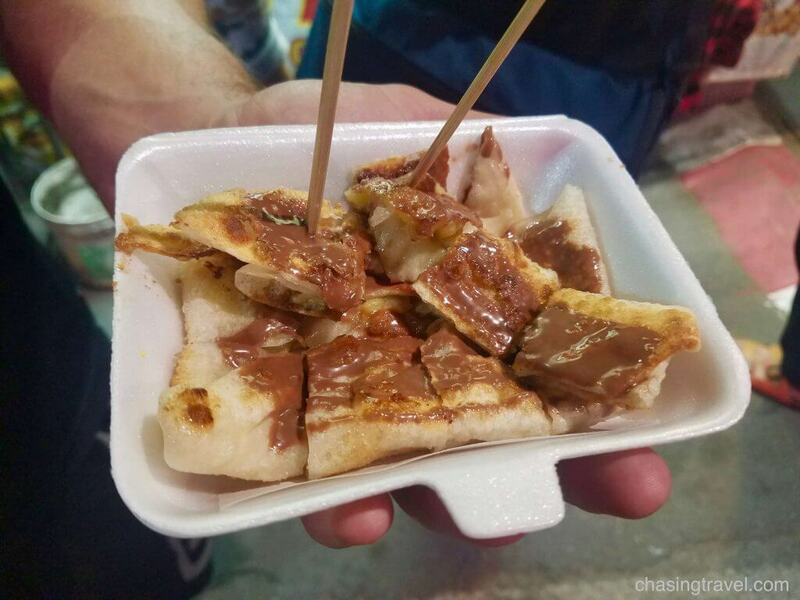 It’s usually topped with sweetened condensed milk, white sugar, banana, or Nutella. The best kind is from this man on Soi 29, Ramkhamhaeng in Bangkok or Alee’s Rotee in Chiang Mai. 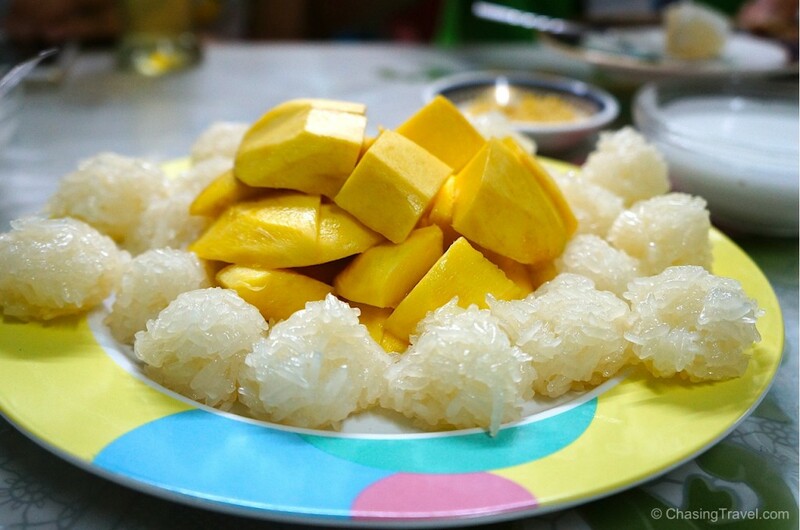 Who knew sweet and sticky rice paired with sweet mango would make a tasty dessert? You can find street vendors making sticky rice at almost every corner. 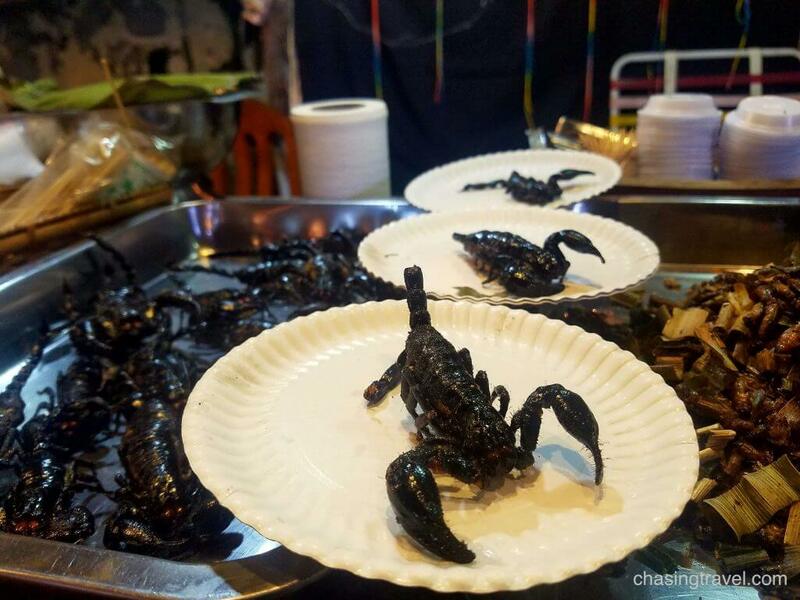 We tried this one in Bangkok while eating with a local family. 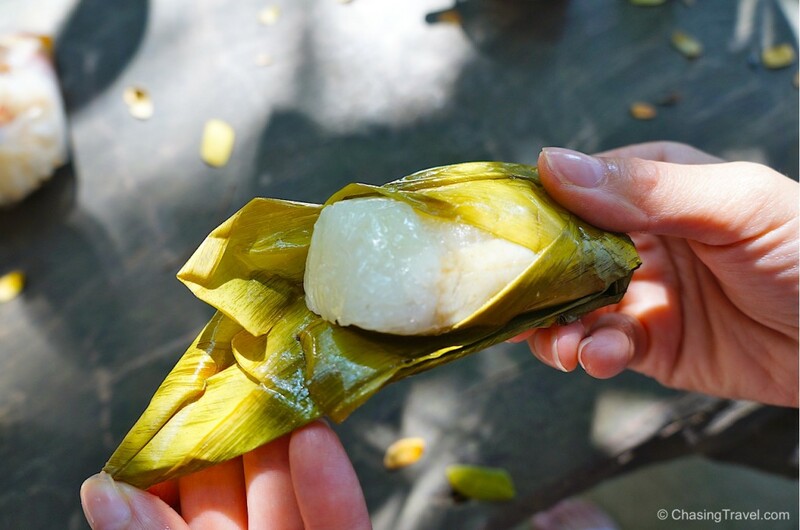 A traditional Thai dessert made by wrapping sweet banana and sticky rice inside a banana leaf and then steaming it. 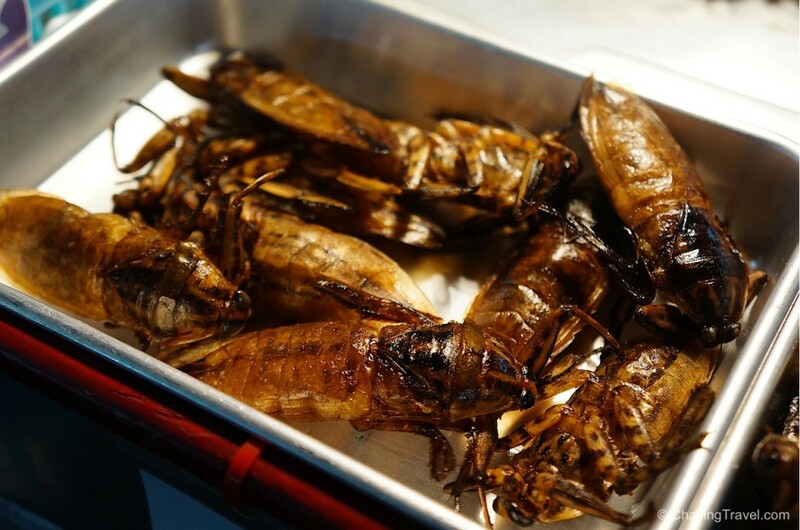 Okay this is not my choice of Thai food to eat, but it had to make the list for the pure novelty of it – deep fried bugs. 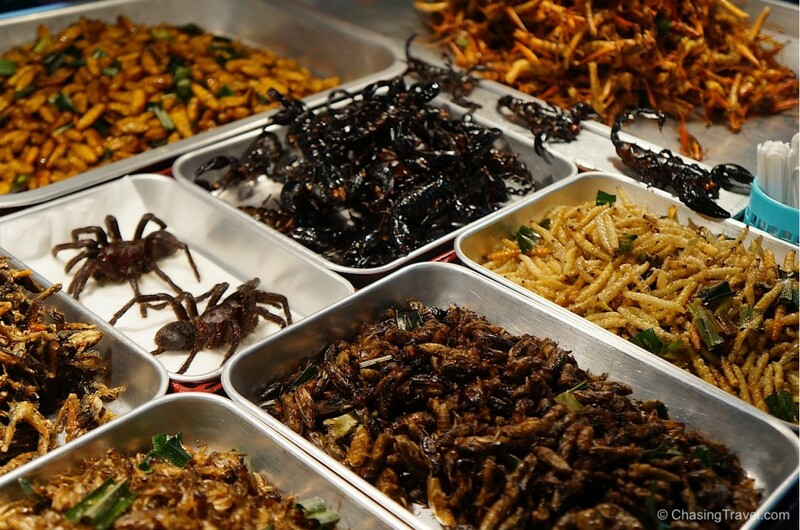 They come in all shapes and sizes, and are ready-to-eat. We weren’t adventurous enough to take these crispy critters down but we happily stood around as others did. I trust they are very nutritious as some claim, but I had just gotten over my 4-day food poisoning experience and I didn’t want another. We found these ones on Khao San Road in Bangkok. Food should be made-to-order, cooked right in front of you. Avoid pre-made dishes that are kept warm, sitting and waiting to be purchased. 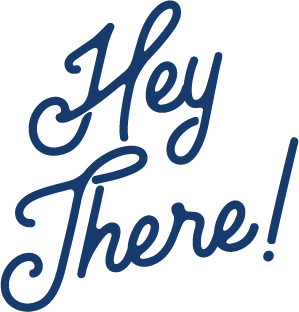 Look for a line up of people, especially locals. This means it’s popular and they have gained a positive reputation. More people in the queue means there is a constant turnover of fresh food to be made. Raw meat and seafood should be kept on ice. No exceptions. Ingredients are stored separately, not mixed to avoid cross-contamination. 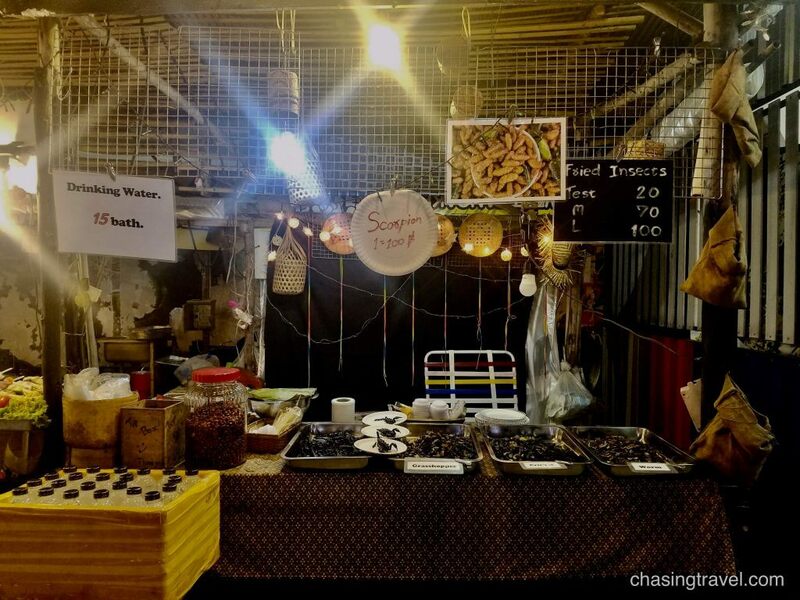 Avoid vendors with too many food options than it looks like they can sell. Too many items or ingredients, the slower turnover of fresh food. 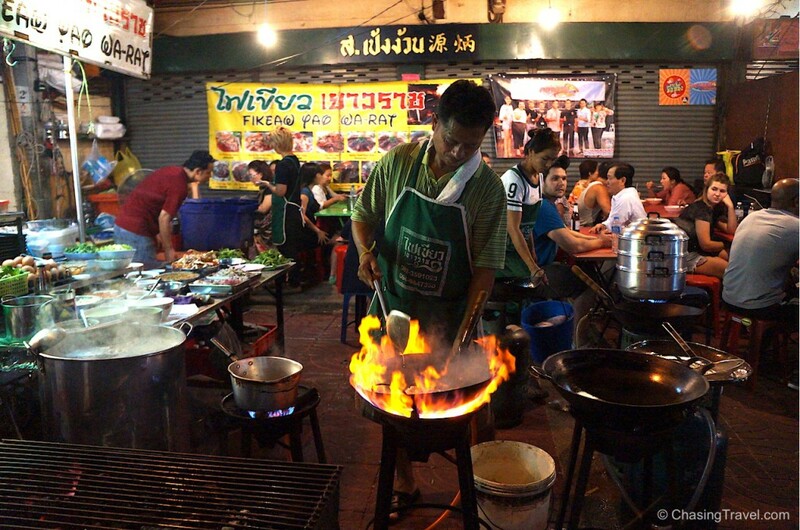 Eat from vendors who cook one or two types of dishes, such as only soup or pad thai. Everything should be covered and well-sealed, away from flying bugs. If you get take-away soup it will come in a clear plastic baggie – don’t worry, it’s a Thai thing and perfectly safe. 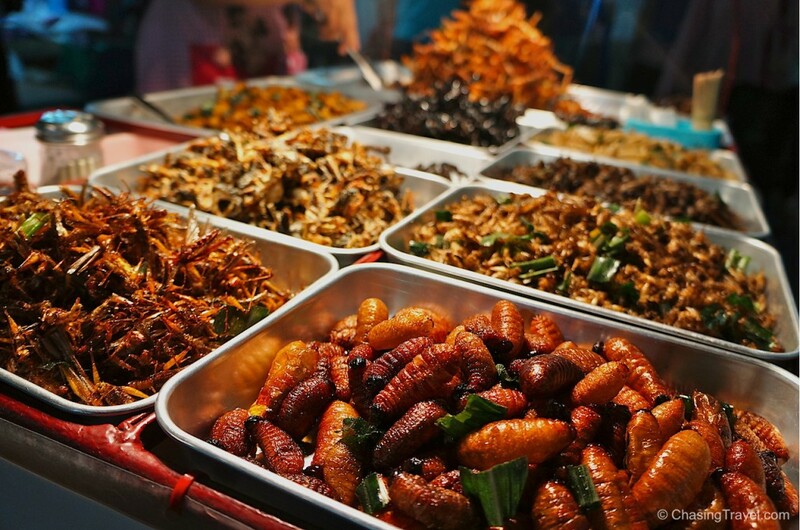 If you’re still not sure about eating Thai food, try a food tour with a local guide. 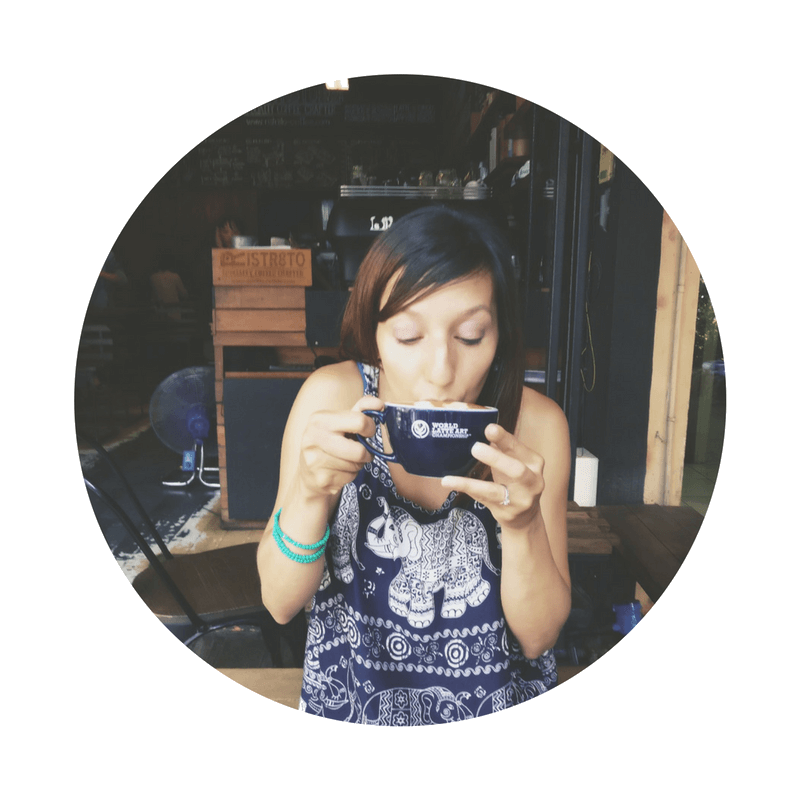 It’s a good way to ease your way into an unfamiliar culture. 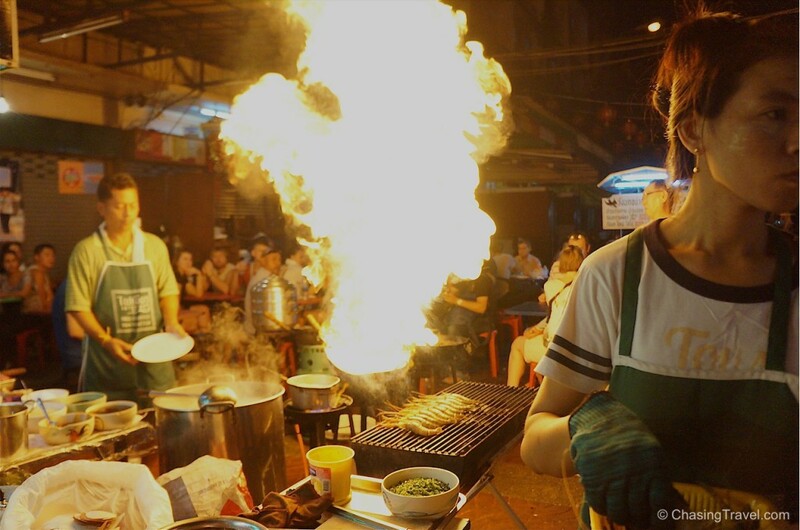 Get Your Guide has plenty of tasty food tours in Chiang Mai like the Chiang Mai Street Food Tour or their gourmet food tours in Bangkok. Our friend Ian taught us some useful phrases while in Bangkok so we could communicate with locals when ordering food. These came in really handy. Pet my – Spicy is it?